Caroline Biribauer, ERCA’s Outreach Coordinator, will speak at the Essex County Field Naturalists’ meeting on the various programs geared to engage the public in our local flora and fauna. Schoolyard Naturalization, Citizen Science, Youth Engagement, and ERCA’s Native Gardens Network will be discussed. Caroline has been with the conservation authority for just over ten years, coordinating volunteers in a wide variety of programs, events, and activities in that time. She has lived and worked in various corners of the Carolinian Life Zone, which has served her well during her 6+ year tenure on the Board of the Carolinian Canada Coalition. She originally hails from Toronto, worked in the United States for just over two years for an environmental non-profit, and has been in the Windsor-Essex area since 2002. Everyone is welcome! 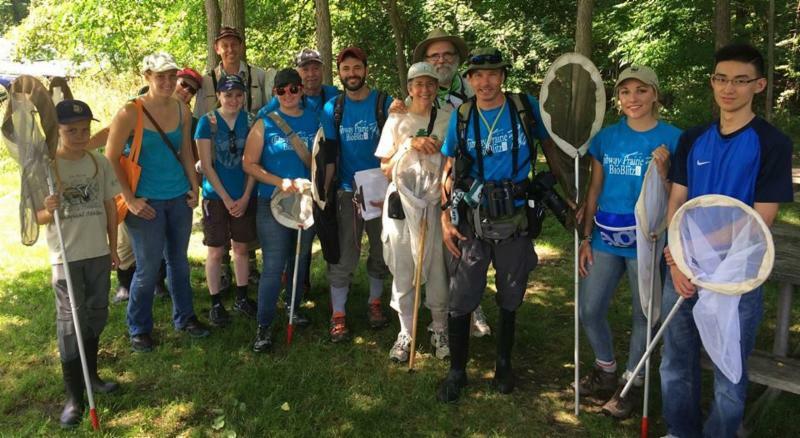 In partnership with the City of Windsor and the Essex County Field Naturalists’ Club, the DRCC participated in the 2015 BioBlitz on July 18, 2015. Despite soaring temperatures, the BioBlitz attracted over 60 experts and hundreds of amateur volunteers who came to identify as many species (including fungi, lichens, plants, fish, birds and insects) as possible within a 24-hour period. The public had the opportunity to join expert-guided hikes and kids got up close and personal with Wild Ontario’s live birds and Sciensational Sssnakes hands-on exhibit. The BioBlitz encompassed the Ojibway Prairie Remnants, including Ojibway Shores on the Detroit River, in the City of Windsor and town of LaSalle. We won’t have a final tally for several months but one new species of fly for Canada has already been identified. Stay tuned! 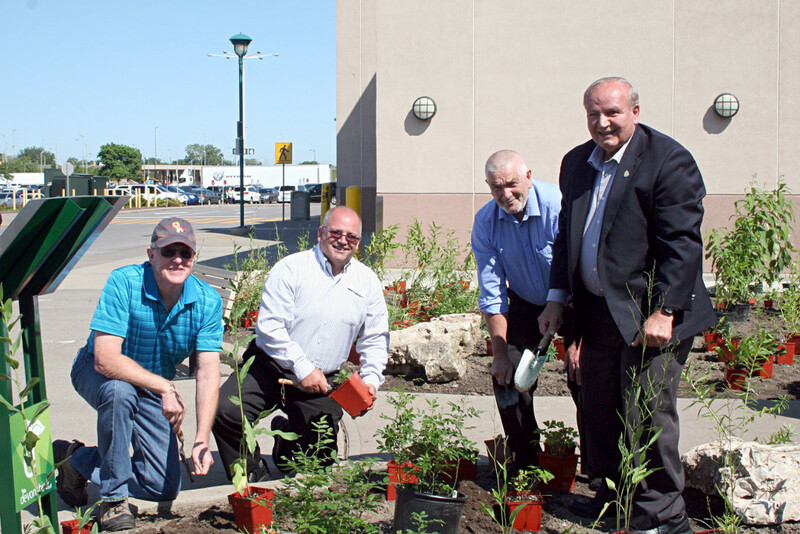 Partners from the Detroit River Canadian Cleanup and the Essex Region Conservation Authority joined management and retailers from Devonshire Mall on July 15 in creating a second native garden near the Bank of Montreal entrance. Following the announcement and sign unveiling which will help mall visitors identify the variety of beautiful native species used in this landscaping project, volunteers helped to plant approximately 700 plants. Butterfly Milkweed, Obedient Plant, and Golden Alexanders were just some of the species included in the 3,300 square foot project. “Devonshire Mall is committed to our community’s environment and is fortunate to work with the Essex Region Conservation Authority and the Detroit River Canadian Cleanup organizations in this important community project,” said Chris Savard, General Manager, Devonshire Mall. This initiative complements the many environmental initiatives already underway at Devonshire Mall. The original outdoor native garden is located at the main entrance adjacent to TD Canada Trust, and the indoor atrium at the food court also feature all native plant species. “The Essex Region Conservation Authority salutes Devonshire Mall for their ongoing commitment to the environment. By working together as a community to create green spaces where appropriate, we can collectively improve our region’s water quality, provide important pollinator habitat, and showcase the relevance of these projects to urban residents,” added Ed Sleiman, ERCA Chairman. Native plants provide the best habitat for pollinator species that naturally occur in our region. Presently, rapidly declining populations of pollinators is of worldwide concern, and this project helps to provide much needed habitat. As well, pesticides and fertilizers used in home and commercial gardens can end up in our rivers and lakes, which can harm fish and other wildlife. With Devonshire Mall’s location in the Detroit River watershed, greening this area with native plants reduces the need for watering and fertilizer, improving water conservation and the health of the watershed. “Projects and partnerships like this are vital to the health of our Detroit River. We hope that mall visitors and local residents will appreciate the garden for its beauty, see the benefits, and will be encouraged to try native plants in their gardens too,” said Claire Sanders, Coordinator of the Remedial Action Plan for the Detroit River. Ian Naisbitt, Detroit River Canadian Cleanup, Chris Savard, Devonshire Mall, Warden Tom Bain and ERCA Chair Ed Sleiman at Devonshire Mall. Photo Courtesy: ERCA. 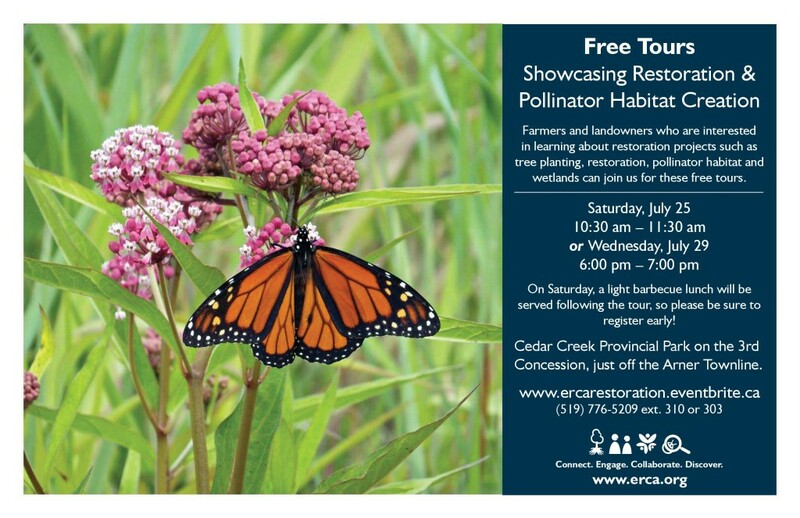 Farmers and landowners who are interested in learning about restoration projects such as tree planting, restoration, pollinator habitat and wetlands can join ERCA for these free tours: July 25 (10:30-11:30am) and July 29 (6-7pm). The Governments of Canada and the United States have launched consultations on Recommended Binational Phosphorus targets to combat Lake Erie algae blooms. As you may be aware, to combat the growing threat of toxic and nuisance algae development in Lake Erie, Canada and the United States have committed, through the 2012 Great Lakes Water Quality Agreement, to develop revised binational phosphorus load reduction targets for Lake Erie by February, 2016.